We are proud to announce that our Hospice Care program has achieved a Level Three status with the We Honor Veterans program. This recognition reflects Cornerstone VNA’s commitment to ensuring veterans have access to quality end-of-life care. We Honor Veterans is a national Hospice provider awareness campaign conducted by the National Hospice and Palliative Care Organization in collaboration with the Department of Veterans Affairs. As a We Honor Veterans Partner, Cornerstone VNA is better prepared to build organizational capacity to provide quality care for veterans and to strengthen partnerships with veteran organizations. In addition, they strive to increase access to hospice and palliative care for veterans living in their community and to network with other hospices across the country to learn about best practice models. 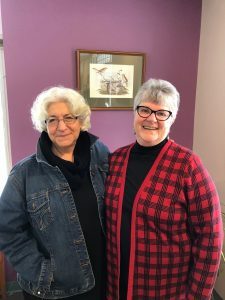 Seen here left to right are Nancy Nicolazzo, Chaplain/Volunteer Coordinator and Paula Carr, Hospice Volunteer and Veteran. For more information about the We Honor Veterans program at Cornerstone VNA, contact Nancy Nicolazzo, Chaplain/Volunteer Coordinator at 603-332-1133 x239 or NNicolazzo@cornerstonevna.org.